It's a battle of wits and fast action, this game in ROM form for Atari® 400TM or Atari® 800TM Personal Computer Systems. 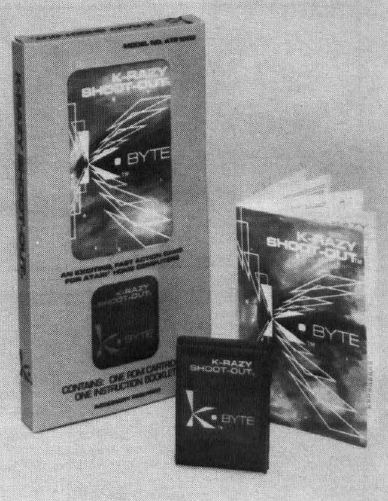 K-BYTE's K-RAZY SHOOT-OUT is available in a solid-state cartridge (ROM pack), individually tested to assure reliability and customer satisfaction. K-BYTE's K-RAZY SHOOTOUT is destined to be a favorite of Atari enthusiasts across the country. For details on K-RAZY SHOOT-OUTTM, contact Chuck Miller at K-BYTETM, Division of Kay Enterprises Co., 1705 Austin, Troy, Michigan 48099. Phone: (313)524-9878.